We signed David Ross to a two-year deal worth $6.2 million as a second catcher. Juan Nieves is our new pitching coach; we are retaining Gary Tuck as our bullpen coach. In other news, the Pats beat the Bills yesterday, 37-31. The coaching staff has now officially been finalized. Tim Bogar is the bench coach. Jerry Royster will take his place as the third base coach. Alex Ochoa is the first base coach. 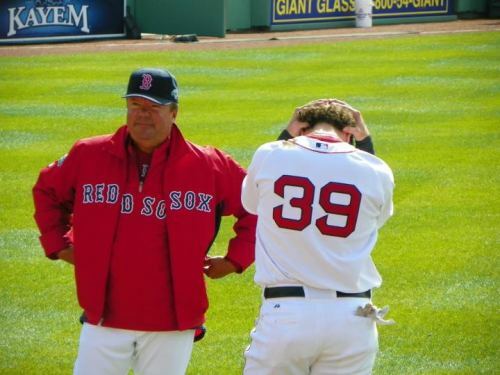 Dave Magadan will remain the hitting coach, and Gary Tuck will remain the bullpen coach. Our new pitching coach is Bob McClure. The Royals let him go after finishing in fourth place in their division last season, and then we hired him as a minor league instructor and special assignment scout. Obviously on the surface, this doesn’t exactly bode well. However, it’s worth mentioning that his professional profile is similar to John Farrell’s; like Farrell, he’s been a player as well as a coach, and he has a knack for evaluating talent. But by now I have learned how fruitless it is to delve analytically into anything that Bobby V. does before I actually see how it shapes up in action. Regarding McClure, I’m not sure I know what to think at this point. We now officially have a closer, and it turns out that it isn’t Mark Melancon. Melancon will obviously be in the mix, but we traded first baseman Miles Head, right-handed pitcher Raul Alcantara, and, yes, even Josh Reddick to the A’s for outfielder Ryan Sweeney and, more importantly, Andrew Bailey. Bailey has a career 2.07 ERA and 0.95 WHIP with seventy-five saves and only nine blown saves in his three seasons in the Majors. He has been injured, which restricted him to less than fifty innings in his last two seasons. But because we expect him to own the ninth only, I don’t see a problem. The Bailey-Melancon one-two punch shows considerable promise. Like Paps, Bailey tends to induce his fair share of fly balls, so Melancon serves as a nice complement to that; in his career, Melancon has induced double the amount of ground balls as fly balls, and only three pitchers last season had a better ratio. So, to put it lightly, he’ll do. Now let’s look at Sweeney. His hitting stats obviously don’t match up well with Reddick’s, but he’s got a solid OBP and he can play all three outfield positions, which we know is incredibly useful. However, I’m still not happy about that part of the trade because, while Sweeney has obvious upsides, he technically doesn’t even come close to Reddick. I mean, Reddick has the makings of a Major League superstar. Of course, we have to moderate that a little by accounting for the fact that he’s young yet and hasn’t seen much action relatively speaking, but still. I see this trade as addressing our short-term needs rather than considering our long-term needs. There is a time and place for doing so, but I’m not convinced that this was it. Again, we’ll have to wait and see. It’s important to remember that this is Ben’s team now, and he deserves a chance to prove that he has as much foresight as anybody. Ryan Kalish will miss the start of the season; he just had surgery on his left shoulder to repair a torn labrum. In all likelihood, so will Jenks, who had another surgery. The Yankees signed Okajima to a minor league deal; oh, how the mighty have fallen. The Cubs hired Bill Buckner as a minor league hitting coach. I hope Theo has fun with that. Incidentally, in case you didn’t notice, that was sarcastic. In other news, the Pats have been on an absolute tear. We beat the Redskins, Broncos, Dolphins, and Bills. We’ll see if we can convert that into anything of note when it counts. The B’s have been similarly dominating; we beat the Habs, Panthers (eight-zip shutout), and Coyotes; we dropped our game against the Stars. We womped the Devils and Flames (seriously, a nine-zip shutout) and lost to Vancouver in a very eventful matchup in which Vancouver was obviously trying to make a statement. I’d say it was grasping; they may have beaten us by a goal, but the last time I checked, we are still the reigning Stanley Cup champions. The benches cleared, though. Five Canucks charged Shawn Thornton for defending a hit teammate, and then all the gloves dropped. Vancouver coach Alain Vigneault says we’re too physical, probably because the Canucks can’t match us. By the way, Milan Lucic did indeed take the ice legally on a line change. Red Sox fans have longed to hear it: the Boston Red Sox are world champions! Saying that was a great day would be the understatement of the century. That was a win for the team, the city, the Nation, and all the players and fans who came before that great year in history. Congratulations again to the 2004 Boston Red Sox on completing the greatest comeback in the history of sports and taking it all the way. I still can’t think about ’04 without getting chills. And to think it all started with a stolen base. Unfortunately the 2008 World Series is out of our hands. To recap, the series stands at 3-1 in favor of Philadelphia. Last night, with rain pouring, the field absolutely drenched, and a one-run lead, the Phillies managed to play long enough to get the game in the books. But the conditions on the field were so bad (the infield was basically mud) that Bud Selig had to call it after the Rays tied it, 2-2. Questioned afterwards, Selig stated he would’ve definitely called the game eventually. This begs the question of why he waited until right after the Rays tied it up. I mean Jimmy Rollins was making error after error, so it was pretty clear that play couldn’t continue. I’m not one to play around with conspiracy theories, but something just doesn’t seem right here. In other news, the Pats defeated the Rams, 23-16. You have to admit, Matt Cassel is improving and improving fast. The Bruins played their best game of the season against the Oilers last night. Tim Thomas was Superman in goal. No score through regulation, and we went on to win it in sudden death, 1-0, courtesy of Dennis Wideman’s power play goal. Not bad for our first overtime victory this year. Not bad at all. Aramis Ramirez of the Cubs and our own Kevin Youkilis received the Hank Aaron Award, and Dustin Pedroia was named to “The Sporting News” All-Star team. We’re bringing back five coaches: John Farrell, Brad Mills, Dave Magadan, DeMarlo Hale, and Gary Tuck. Luis Alicea was not offered a new contract and will not be returning in 2009.